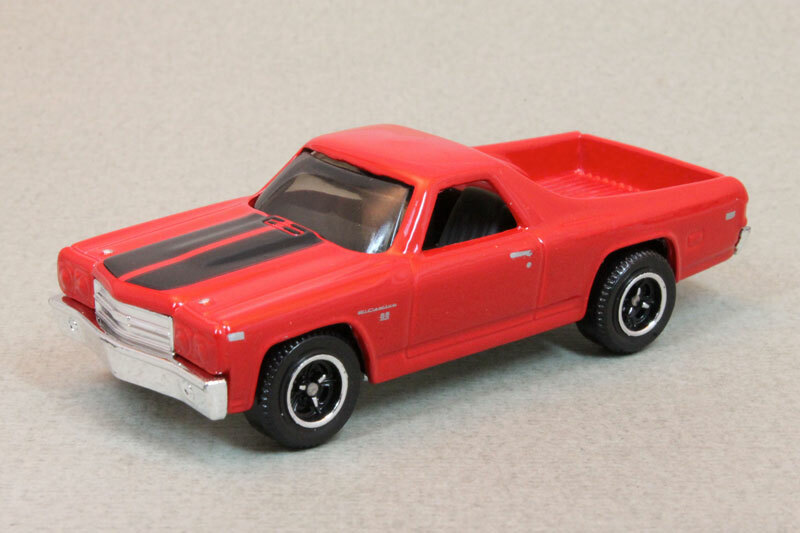 My most treasured Matchbox car was a red 1970 Chevrolet El Camino, slightly souped up. I thought Hot Wheels didn't look real enough. Plus, the wire axles always bent and stayed bent, crippling its otherwise straight, smooth glide. But Matchbox cars were more durable, realistic, and ideal for miniature pretend play, one of my favorite activities as a kid. Life was about play back then, and it was fun to act it out in 1/64th scale. Terrible accidents were made cool and without damage because they happened in slow motion. I tumbled the car 2" to 4" off the ground, carefully with both hands, as if I was studying the g-forces at work, perfectly choreographed to engine racing and metal crashing sound effects that spurted from my twisted, amateur trumpet player combined tongue and lip rapid vibrations, sans trumpet. I'd imagine the sidewalk creases along the edges of each concrete pad as roadways, and the expansion cracks as construction zones and potholes. The more realism, the better. But still, it was just play. Then I started to grow up and encounter construction zones and potholes in my life. The tumbles were no longer carefully orchestrated, and there were no do-overs or getting called to dinner as a snap back into reality. "I gotta go home now," turned into, "I gotta leave home now." Only, where was I going, especially when others around me didn't know the script playing in my head, or even want to play the same game? I know I hurt people during my relational experiments with them. I didn't fully appreciate just how real they were at the time, nor how permanent the scars would be. I guess I hadn't fully disconnected from the pretend play. Well, that's not entirely true. I didn't want to fully disconnect from the pool of predictability and dive head first into the vein of vulnerability. But it was the only path back to the heart. Over time, with help of certain friends, family, books, audio tapes, videos, prayer, therapists, counselors, pastors, and support groups, I became aware that I needed to let go of what no longer served a steadying purpose in my life, and embrace the ebb and flow of change. I had to mature. But how? When I became serious about life, I realized it was a journey. Where this journey was leading was unknown at the start. That is why it is properly called an adventure. Mostly I defaulted to just trying to fit in, wondering why I didn't. Why was I different? Sometimes, as each step revealed itself to be a choice of love, I took it. As I surrendered more frequently and bravely to those steps, life began to make sense, its destination gained clarity, and new experiences of increasingly greater joy I discovered in its path. I did not have to be concerned with the pursuit of happiness. Rather, I wanted to be engaged in the happiness of the pursuit. My present pursuit is not what it was. I only vaguely knew then what I really wanted in my heart, which was to know God. Sometimes I thought I wanted what the world thought I should want. Many sources --religious, philosophical, historic, humanitarian, dogmatic, spiritual but not religious, new age, law of attraction-- actually hindered my search because I thought I'd find the answer among them. I did not. Intellects and emotionally confident folks would massage my brain with their sure words and fantastic ideas. Yet, I'd discover my soul still barren, waiting to be born. What those folks had to offer seemed like chewing gum that had long since lost its flavor and never providing any real nourishment. I gave up seeking many times, sometimes for years. My motto became, "Take what you like and leave the rest." I took nuggets when I could. The rest was mostly mud. Some of it was muddy nuggets. They meant well, very well, and helped a lot of people. They found an answer and clung to it, studied it, put it practice, and then taught others. I don't why, but I wanted deeper, more solid answers. So I kept asking, seeking, and knocking. No, my present pursuit is not what it used to be. My resolve to know God has grown stronger than ever now, and most rewarding, especially since I learned He wants to be known. Now the clarity of my destination, the reason for my journey, the cause of joy in my heart, and the rest promised for my soul is unbounded by His word. By choice, I humbly submit to His truth, His reality. His truth has set me free indeed. His grace is far more glorious than I could have imagined. Having experienced all kinds of ups and downs in this life, do I still wish to know God? Absolutely! More than ever! The power of Your love can save souls. The power of Your grace can transform lives. I will mediate on Your love so that my cup overflows. I will be transformed by the renewal of my mind through the study of Your word, which is the truth about who I am, whose I am, and why I'm here. Through the partnership of Your grace and my humility, with the power of Your Spirit within me, may I walk in a manner worthy of the calling to which I have been called. 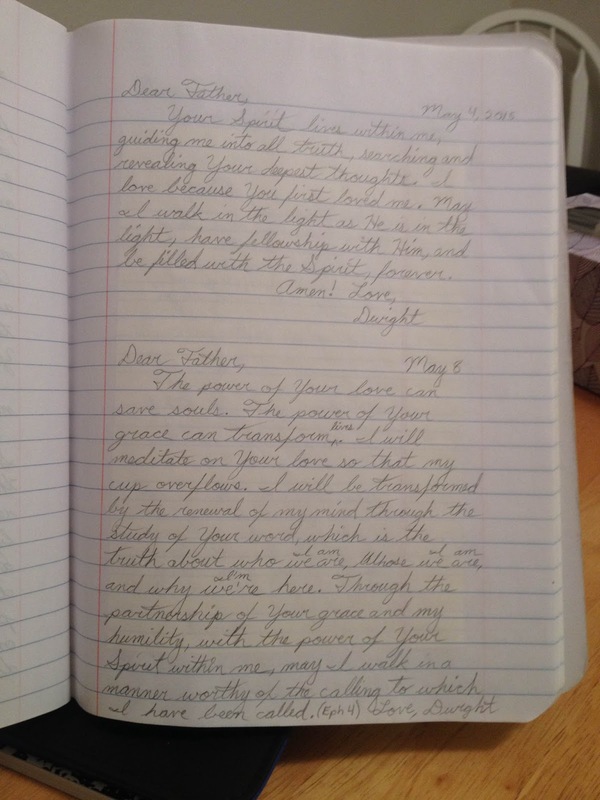 Prayer journal entry May 4th and 8th (above), 2015. 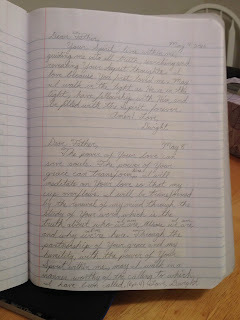 I write my early morning prayers freehand, slowly and carefully. Tediously is a better descriptor. Not that I want to. It's that I suffer from 'Essential Tremor'. I think that's what it is. Nothing else seems to fit how I would describe my symptoms, which just collectively celebrated their 11th birthday. Whoopee! I know not why it started, nor do I know how to stop it. My hand is fine when I use it to text, drive, and drink. (Gotcha!) Yes, of course, at different times. But when I write freehand, which I prefer over typing actually, I steady the forefinger and thumb of my right hand with a firm grasp of the same digits on the left. The resulting penmanship looks pretty neat, if I don't say so myself. The pace rots, not rocks, however, at a grueling two pages per hour, estimated to be a similar rate at which cavemen chiseled environmental observations on stones ("Buffalo antelope on plain. Grunt."). So if it's so difficult, so tedious, why do I do it? When I write freehand, I stir the words in my head and, as much as I can, my heart, like Campbell's Alphabet Soup that's too hot. Doesn't seem like much, does it. Thinking in writing is what I'd like to think I'm doing. I noticed I think differently when I type. I like how my thoughts are less random, less trying to impress, and more concerned about what's authentic, what's moving in the moment to me. I guess I'll get used to this keyboarding stuff. I'll have to; I want to share my thoughts with you, if you'll let me. Looking back at that prayer from May 8, 2015, I'd change a few things. For example, the ultimate thrust of "all truth" in Scripture is all about His eternal plan for the church. Not who I am and whose I am, although that's part of it. Kind of the wrong perspective, that's all. Let my focus ever be on Him! Look a little closer and I hope you'll see my references to Scriptures dancing in my head, singing to my heart. Some of the obvious ones are the cup overflowing from Psalm 23. An abundance of meditation passages are found throughout Psalms, such as Psalm 119. Being transformed by the renewal of my mind is from one my favorite verses, Romans 12:2. The study of His word is my reference to verses like 2 Timothy 2:15 and Hebrews 4:12. The manner of my walk takes me back to Ephesians 4. I love it all, truly I do. If only this world wasn't so darn distracting, difficult, and tedious, like my 'Essential Tremor'.